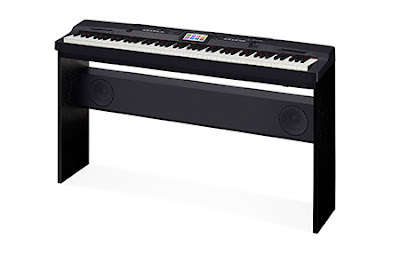 Andrea's World Reviews: Christmas Wishes - Casio CGP-700 Compact Grand Piano Giveaway! Christmas Wishes - Casio CGP-700 Compact Grand Piano Giveaway! I get to share a lot of great products with you all during the Christmas Wishes event, but this very well may be the best yet. This is an item that the whole family will love. It is fun, practical, stylish and, in a way, educational. 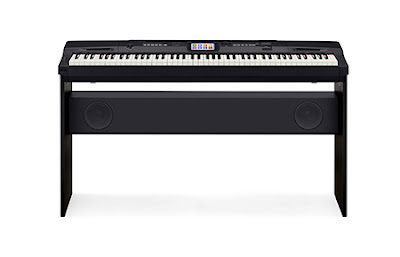 Introducing the Casio CGP-700 Compact Grand Piano. The name says it all, this is truly a Grand Piano, but Casio's amazing CGP-700 is compact and digital, so you save money, save space and get so much more than just a premium quality piano. The CGP-700 boasts a 9-foot concert grand piano sound. A meticulous recording session, with over two dozen microphones, ensured a dynamic and expressive concert grand piano that can be used in stereo or mono, and even includes damper resonance simulation. 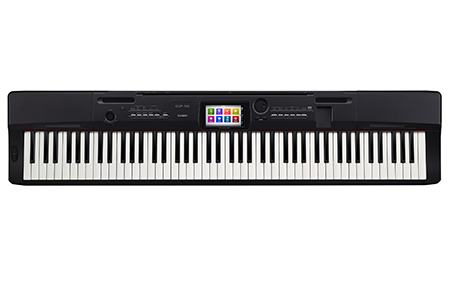 Just like a grand piano, the keys have a heavier feel in the lower register, and a lighter feel up top, thanks to Casio's famous Tri-Sensor Scaled Hammer Action II keyboard. Even the surface of the keys feels natural, with the reproduced textures of both ebony and ivory. The CGP-700 goes far beyond piano, with 550 different instrument tones. You'll find a variety of guitars, strings, basses, drums, synths, and more. There is also a powerful effects system with reverbs, delays, and other essentials. The centerpiece of the CGP-700 is a beautiful 5.3" Color Touch Interface. This hi-res display is bright and clear. Everything is at your fingertips so you stay in control. You can simply swipe and tap your way to the perfect tone or rhythm. There is even a Grand Piano button that puts it back into Grand Piano mode in one press of a button. Whether you are playing as a Grand Piano or a veritable orchestra of other instruments or even listening to your MP3 player(phone) via the stereo aux input, the unique 3-way speaker system will easily fill the entire room with rich, true sound. With the CGP-700 you get all the amazing sound of a Grand Piano. Unlike a traditional Grand Piano, you also get the bonus of other rhythms and instruments. You also get the portability that a traditional Grand Piano could never provide. The CGP-700 can easily be removed from the stand. It weighs only 26 pounds, so you can have premium sound anywhere. The CGP-700 also connects to your computer, mac, iPad or other device with no drivers needed. Its 1/4" outputs mean you can easily connect to a mixer, amplifier, or PA system. It uses both MIDI and USB audio recorders, so it is so easy to transfer your music to a computer to save it and share it with the world. The CGP-700 is also perfect for a student and teacher to play/learn together. There is a Duet Mode, which splits the keyboard into two equal ranges, so teachers and students can play side by side. It offers dual headphone jacks as well. The Duet Mode is a huge asset for me. Our entire family loves music, but none of us are talented or even taught musicians. I would love my children to learn to play for real, and I wish I could teach them, but that will never happen. I can however get them a piano teacher, and I love that they can play side by side with my kids. My son especially(who has autism) is a visual and hands on learner. Spoken lessons would not be effective for him at all. Also, Duet Mode will make it much easier for my children to share this piano. They can split the keyboard and each wear their own headphones, they can create their own music without having to fight or wait their turn. That feature alone is a selling point for me. Anything to keep the peace. Every single thing about Casio's CGP-700 Compact Grand Piano is completely incredible. 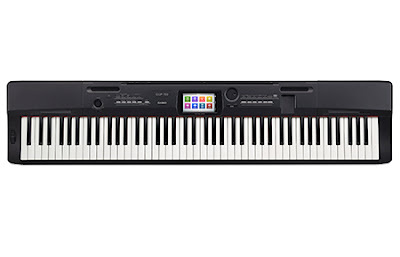 If you are a skilled pianist or a beginner or even someone who has never played, the Casio CGP-700 would be the perfect piano. Its amazing sound quality, style, space saving design and host of other sounds make it a true do-it-all instrument that anyone can enjoy. If you are as impressed by the CGP-700 as I am and want to own one yourself, it is your lucky day. Casio has been generous enough to offer a CGP-700 Compact Grand Piano to one very lucky giveaway winner. Enter below for your chance to win this incredible prize. Be sure to also enter the other giveaways in this Christmas Wishes event. There are thousands of dollars in prizes to be won. You can find the other giveaways via the School Rules tab on my site, or by clicking HERE. My daughter and I do and we completely love to do this together. I love the style and all of the features! I don't play the piano, but we had an antique player piano when we were kids that we all banged the keys on haphazardly. Just recently my sister was talking about how much she wished we hadn't sold it after my Mom passed away, because she'd love for her grandson to learn piano. This would be perfect for that. The kids play, not me. I think the MIDI and USB audio recorder feature is a fun feature for the kids so they can save their music and share it with friends. I used to when I was younger. I like that this doesn't take up a lot of room and has a lot of features that our son would love. I used to play but I want to give this piano to my brother who is a worship director. I like that it is portable, unlike a regular grand piano. I play and my daughter wants to learn. I like the size specifications on this. My mother plays the piano. I like the compact size. We have a keyboard, but it isn't anywhere near this nice. I like the duet mode so they won't fight over it. I do play keyboard! It would be such a treasure to own this keyboard - I like the extra features it has. My husband plays the piano. I like that you can connect it to the computer. I do play the piano. I like the compact size. I do not play piano, but a friend of mine does and would love that it's small enough to fit in an apartment size living room! I play the piano, but no longer own one. The size of this casio piano is perfect! How nice it would be to play again! I've never played but would love to get lessons for my grand kids. Piano was my 2nd major ;) I love that the keys are weighted and takes little space for my daughter who wants to learn! I dont play but would love to learn. I dabble. I'm not that great, but I can play a bit. And I love how light weight it is. I don't play but my husband does and I love the compact size of this piano. Yes I Play The Piano, I Like The Compact Size! I played when I was young. I like that it would fit in my apartment so I could play again. No I don;t but my son does. My daughter plays. I like the small size. Do you play piano? What do you like most of the CGP-700? Yes, I do play piano. What I like most of the CGP-700 is how compact it is! I play the piano, and my kids have taken some lessons also. I love the portability of these machines, yet they still have a full, rich sound. I don't play well, but I'm a singer and want to be able to practice my music at home. I like that this is easy to set up. I do play and I love the connectivity, I've never had a keyboard that connects to my computer. I love the over 550 instrument tones. I don'y play but my daughter wants to learn. I used to play. I think my kids will enjoy the duet mode. I don't play the piano. This would be a gift for my son. He's a wonderful, and talented young man. I play the piano and I love the duet feature. That will be great when my daughter is ready to learn. Its been years since I've played! I like how its compact as i have so little space in my house! I don't play, but I've always wanted to learn! I do play piano! I studied classical piano for over 20 years and I taught piano for 6 years. I would love to win this to teach my kids and teach lessons on again! I don't play I really like the Duet Mode that helps you learn. I do not play the piano, but my daughter wants to learn. She is very musical and plays in our school band. I love the fact that this is compatible with an iPad and has the bonus of other instruments and sounds too. I use to play the piano when I was younger. My kids are just at the age where they can start learning and I would love that. I currently don't but my dad plays the organ at church. I have a son-in-law and 2 granddaughters who play piano and would love this. I like the sound quality, style, space saving design. I play piano. Took lessons for 7 years and now I'd like to teach my children. I like the small size of this piano... Perfect for an apartment. I do not play the piano, but this would make a very special gift for my nephew. I do play, albet only moderately well and I'm very rusty! I had a Roland many years ago. Love this has 550 different instrument tones! I like how compact it is. thanks for the chance. I would love to learn how to play this. I know a couple songs on the piano but my Dad can play and is trying to teach my daughter. I play a bit. Winning this will give me an excuse to play more :) Totally love the 88 weighted keys, plus the backing tracks are top notch! I do not play but my daughter would luv to learn. I like the space saving design...it wold fit perfectlly in our family room. I took piano lessons for many years when I was a child but I have not had one to play in a long time. One of my favorite features of the CGP-700 is the space saving design. My girls do. I love the size. Perfect! Another issue to notice is that some individuals may complain concerning however the piano sounds once it truly is not dangerous. a typical mistake is confusing the sound of the piano and also the speakers. This is a awesome reviews and this piano is also awesome. If you need some more best digital piano reviews you can visit www.digitalkeyboards.net. Here you will find the best digital piani, best digital piano reviews and buying tips.